The Flat River flows through the counties of Montcalm, Ionia and Kent. The mainstream originates in the Six Lakes area and flows approximately 70 miles until it joins the Grand River at Lowell. The Flat River mainstream starts at the outfall of First Lake in Belvidere Township, Montcalm County. Approximately 1-1/2 miles downstream is the M-66/46 bridge crossing. From this bridee crossing to Langston, approximately 22 river miles, there are many windfalls and carryovers. This and the general low water in summer months, makes this portion of the mainsteam generally unsuitable for canoeing. Access to the mainstream below Langston may be obtained at the Montcalm County Park along M-91. From this point to the City of Greenville is about nine river miles. At Greenville, the dam must be protaged. Between Greenville and the City of Belding, the river flows through the Flat River State Game Area. At Belding a second dam must be protaged. About three miles below the dam at Belding, near the Village of Smyna, a dam has been removed exposing the old log cribs. The swift water at this point offer a challenge for the novice canoeist. About 5.5 mile futher downstream is the Whites Bridge Dam, which must be portaged. At Whites Bridge, one of the two covered bridges in the Flat River system, there are no publicly provided access facilities. About five miles below Whites Bridge is Fallasburg Park and the second covered bridge. Three miles below Fallasburg Bridge is Burroungs Dam, which must be portaged. 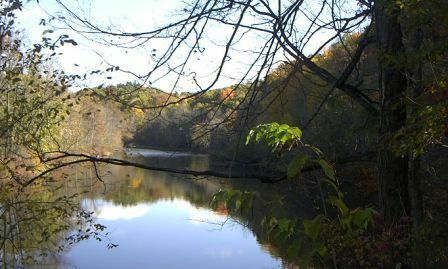 This portion of the river runs through the Flat River State Game Area. The fifth dam on the Flat River is located in the City of Lowell.